I loved this! For the filling, I chose a combination of fresh blueberries and raspberries. This tart is so simple and tastes absolutely wonderful. The cornmeal in the crust gives a nice added crunch. I made the crust in the food processor and just dumped all the water in at once instead of one tablespoon at a time. My dough was really wet and I had to add quite a bit of extra flour to the surface as I rolled it out in order make it manageable. When I make this crust again, I will start with 1/4 cup of water mixed with the buttermilk instead of 1/3 cup. Then if necessary, I can add more ice water. The recipe for the dough can be found on page 371 of Baking with Julia and the Galette on page 377. The recipe’s are also posted on the blog’s of the host’s for this month — Lisa of Tomato Thymes in the Kitchen and Garden or Andrea of The Kitchen Lioness. Thank you to the hosts! Glad you liked it so much; I love your berry combination! Love, love, love…raspberries and blueberries. We really enjoyed this recipe, too. The dough is a bit soft and sticky, but it comes out really well i the end. Looks delicious! I used less water and my dough was perfect! Before I could enjoy your galette picture, I’ve almost bitten into that beautiful biscotto! Thanks for the compliment. That biscotti was great! I wish that I had a better picture of the galette, but I didn’t have good light and we ate it all within about 30 minutes of coming out of the oven so I didn’t get a second chance at a photo! This was a delicious summer dessert, we enjoyed it! Yes, any summer fruit would be great in this crust. We went with blueberries too 🙂 Really enjoyed how the simple treatment played on the freshness of the fruit. I did enjoy it’s simplicity! I do love the simplicity of galettes! Glad your dough worked out for you. 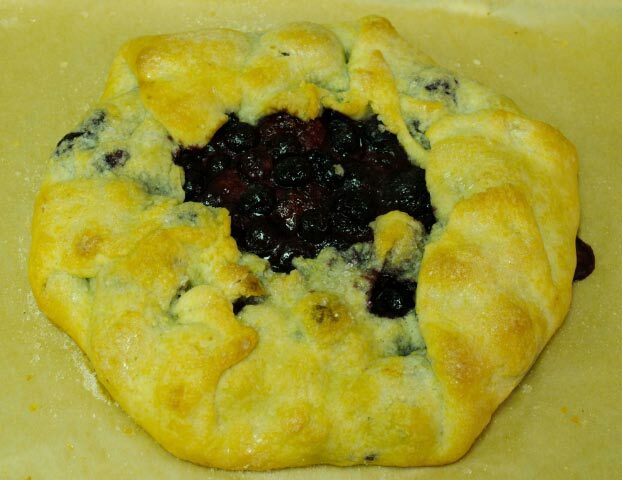 I ended up using the leftover dough I had from the blueberry pie.